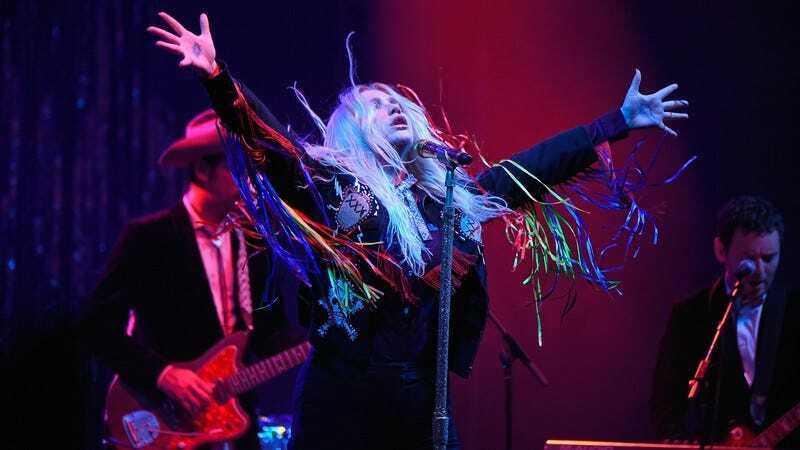 Her painful, extended legal battle with her former producer and alleged abuser Dr. Luke still isn’t over, but musically, Kesha is moving on. This morning, she announced Rainbow, her first new full-length album since 2012’s Warrior. (She released an EP, Deconstructed, in 2013, and a single, “True Colors,” with Zedd last year.) Featuring guest spots from Eagles of Death Metal—who appear on two songs—and Dolly Parton—who guests on a cover of her song “Old Flames Can’t Hold A Candle To You”—the album promises a new musical direction for the embattled singer-songwriter, as well as a new, ’70s-influenced aesthetic. I’ve overcome obstacles, and I have found strength in myself even when it felt out of reach. I’ve found what I had thought was an unobtainable place of peace. This song is about coming to feel empathy for someone else even if they hurt you or scare you. It’s a song about learning to be proud of the person you are even during low moments when you feel alone. It’s also about hoping everyone, even someone who hurt you, can heal. Rainbow is out August 11. You can see the video for “Praying” and the album art below, courtesy of Pitchfork.